UNLAWFUL DETENTION: NNAMDI KANU'S ONE YEAR IN PRISON -- KANU MUST BE RELEASED AS HE APPEAR IN COURT ON 8TH NOV 2016. RESOLUTION ON SECRET CRUCIAL MEETING BETWEEN DAVID CAMERON AND MOHAMMADU BUHARI: "MAZI NNAMDI KANU MUST BE HELD IN PERPETUITY IRRESPECTIVE OF WHAT THE COURT AND HUMAN RIGHT ORGANIZATION SAYS. AS THIS IS THE ONLY WAY TO EXTINGUISHED BIAFRA". It is now clear to the world that the leader of indigenous people of Biafra IPOB, Mazi Nnamdi Kanu is a prisoner of conscience, POC. It's now clear that he committed no crime against anybody, group or Nation. It's now clear that Mazi Kanu was arrested, tortured and incarcerated because of his commitment and determination towards the restoration of sovereign state of Biafra. Right to self determination and freedom of speech is an international law as enshrine in UN charter, world democratic constitutions, including Nigeria. It is on this global constitutional right that the leader of Indigenous People Of Biafra (IPOB), Mazi Nnamdi Kanu premised his divine quest for Biafra restoration. He started by setting up an indigenous radio station called 'Radio Biafra' in accordance with article 16 of 2007 UN Charter; "Indigenous peoples have the right to establish their own media in their own languages and to have access to all forms of non-indigenous media without discrimination". 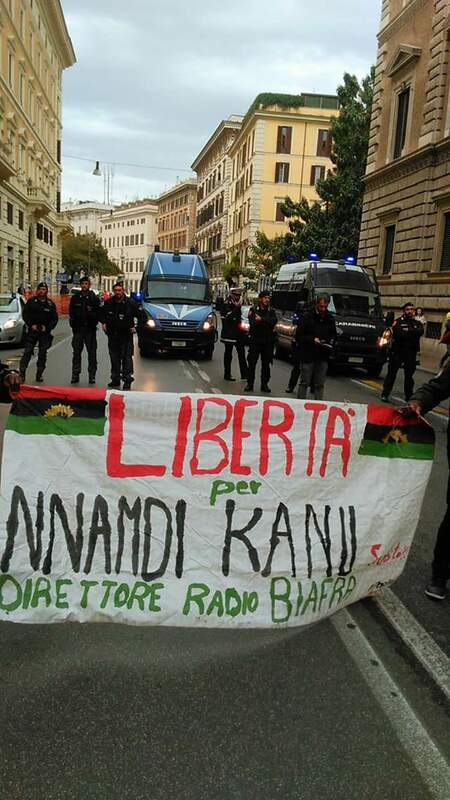 Radio Biafra which can be received anywhere on planet earth was aimed at sensitizing indigenous people of Biafra (IPOB) who are scattered across the world about the new nation. As the wave of his(Kanu) freedom massage in disseminate through Radio Biafra, attracting millions of followers across the globe, Muhammadu Buhari led Nigeria government was panicked, to stop him(Kanu), he(Buhari) must break the law, condescend to kidnapping, flout court orders, bribe judges and arrest those(judges) refuse to take bribe. Muhammadu Buhari through his murderous DSS kidnapped the leader of IPOB, Mazi Nnamdi Kanu on 14th Oct 2015 in his hotel room in Lagos. After then, it was reached between him (Buhari) and David Cameron in a secret crucial meeting that Mazi Nnamdi Kanu must be held in perpetuity irrespective of what the court and human right organization says. As this is the only way to extinguished Biafra. While the leader of IPOB were still on trial on three bogus count charges, Muhammadu Buhari arrogantly informed the whole world on his national media chat on 31st December 2015 that he is both the Executive and Judiciary and hence, Mazi Nnamdi Kanu shall not be granted bail. Before his (Buhari) infamous media chat, some honorable judges such as Shaubu Usman and Justice Adeniyi Ademola have in separate court sitting granted Mazi Nnamdi Kanu conditional and unconditional bail respectively. But Muhammadu Buhari flouted it saying that Mazi Kanu shall not be released, perhaps because his master David Cameron have instructed so. Buhari continue his barbaric attitude by arraigning Mazi Nnamdi Kanu on federal high court yet again before another judge (i.e after being discharged and acquitted by justice Ademola of federal high court). This time, it is a highly compromised judge, justice John Tosho, the judge who received the sum of 100 million naira from President Buhari for the sole purpose of convicting and sentencing Mazi Nnamdi Kanu. Tosho's evil plan was laid bare when he contradicted his own ruling which subsequently led to his shameful withdrawal from the case. IPOB leader's case: Before the new judge in charge of the case, justice Binta Nyako was made public, Buhari-DSS have brutally raided the houses of some courageous and unbiased judges at midnight, sparing justice Binta Nyako on the condition that she will continue where justice John Tosho stop. Justice Nyako assured the presidency of her undivided loyalty and promise to truncate the IPOB 8th Nov ECOWAS court date by fixing her own date same day. IPOB leader is now one year in unlawful detention, as he appears before ECOWAS court on 8th November 2016, IPOB worldwide will expect nothing less than his unconditional release in accordance with the precept law or else IPOB will be forced to unveil their military wing.